When I first picked up this deck I assumed, given the title, that it would be a deck heavily involved with crystals and their properties. Not being a lover of such things, I wasn’t anticipating this deck. However, the title merely denotes the gift of clarity of sight that the artist, Jennifer Galasso, wishes upon the reader of her Tarot deck, and is also a reference to the Stevie Nicks album of the same name. Jennifer is a well-known fantasy artist with a focus on the realm of fairies, dragons and mermaids. She creates a world that is populated with magical creatures, tree spirits, forest glades and beings that live in harmony with their natural world. Throughout the Crystal Visions Tarot we find butterflies, dryads, angels, dragons, crystals growing from the earth, powerful giant cats, knights in shining armour, soaring eagles and nymphettes in dresses that most women of the fantasy persuasion would die for. One thing’s for sure: the Crystal Visions Tarotis a very pretty deck to look at. Throughout the deck we find a colour scheme that in places could be described as bruise-purple, and in others as ethereal sunset. This beautiful colouring enhances the fantasy theme of the deck, and makes the reader feel drawn into the world that Jennifer has created. There is also a distinct colour scheme running through each of the suits in the Minor Arcana, highlighting the cards’ shared qualities and nature, and making readings aesthetically pleasing. The Crystal Visions Tarot is based heavily on the Rider Waite Smith tradition, and the card meanings depicted are standard to that tradition. The images on the cards are in places just re-interpretations of the Rider Waite Smith ones but with added fantasy style, but in other places there are some truly innovative images. Death, for instance shows a woman lying upon a rock, herself as pale as the rock, stone-cold, while the angel of death gently reaches out a hand to touch her. He holds a staff in his hand upon which is an ankh, the symbol of life, and above the woman a ray of light caresses her body, in which butterflies flutter. Beneath her are white lilies, and upon the rock is carved the Latin phrase “Vita Mutatur Non Tollitur” (“life is changed, not taken away.”) In the Devil card we find not the traditional Christian image of Satan but instead a pastoral scene in which a beautiful, naked woman sits at the base of a pomegranate tree offering the fruit out to the reader whilst Pan himself plays his pipes. readings – it is also completely inoffensive, not rocking the boat at all. Of course, if you want a deck that will challenge your understanding and offer you a lifetime of study, the Crystal Visions is not the deck for you. But it is the deck for those who want to read the cards for divination. It would be brilliant for beginners, particularly because the Minor Arcana are so evocative. Each card is very open, delightfully free from overt occult symbolism, but the meaning is captured instead in the essence of the scene, as if the reader has stumbled upon the scene in the card and is a viewer being granted a sneak peek into the world of these fantasy beings. 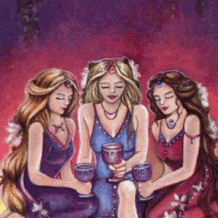 In the Three of Cups we see three women, all different, sitting close together at a pool, holding cups as if they have met up beneath the moonlight to drink together and talk, catch up, give each other advice, share in each other’s joy. In the Two of Cups we find a touching and intimate scene between a man and a woman who are sharing their emotions (symbolised by pouring water into each other’s cups) beneath the full moon, naked and free (though hair covers the woman’s body – nothing that could be deemed offensive here!). 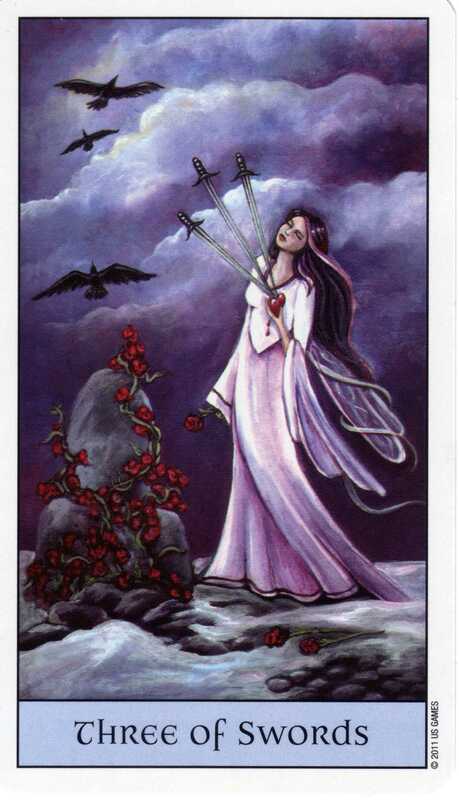 The Three of Swords shows a woman weeping and wailing as she wanders frozen wasteland, her heart pierced with three swords and bleeding, while above her three ravens fly into a stormy sky. In places the emotions depicted in the cards are so raw and obvious, the characters to expressive of their feelings, that it speaks to the reader on a level other than just the symbolic level. These are human emotions and feelings, ideas that every reader can relate to. This makes the Crystal Visions an approachable and accessible deck. also the environment they depict. 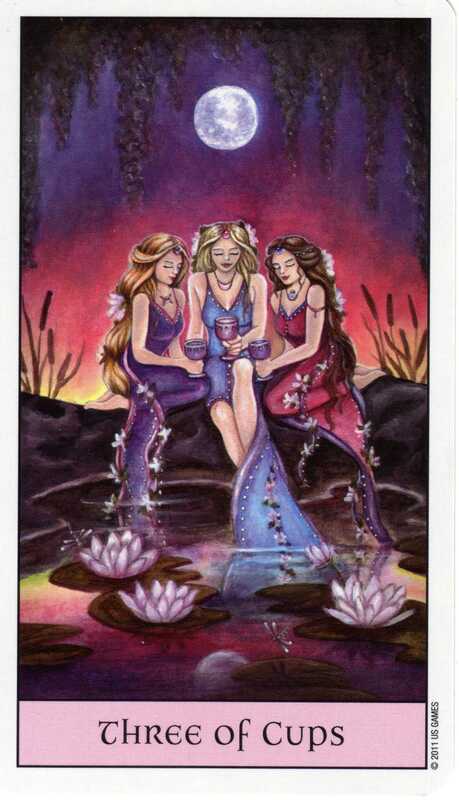 In the suit of Cups we find each card populated by dragonflies and water lilies, bulrushes, pools and water and the moon in varying phases. The suit of Swords shows us scenes set in frozen wastes and icy mountaintops, with stormy skies above in which ravens fly. 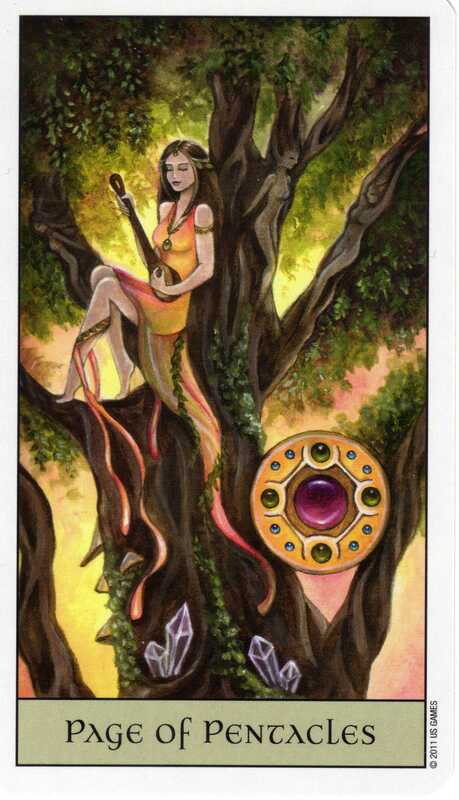 The suit of Pentacles brings us forest glades, strong trees, crystals growing from the ground, and fruit in abundance. Finally, the suit of Wands shows rocky, mountainous desert regions lit by many fires and torches, where we find powerful giant beasts, lions, horses and dragons. 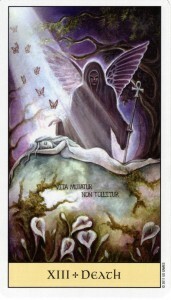 Court Cards in the Crystal Visions Tarot are easier to read than many Rider Waite-inspired decks. The characters seem to have personalities of their own, making them easy to relate to, and are often doing things that evoke meaning, particularly the Pages: the Page of Cups is scrying, and Page of Pentacles playing a lute in a tree, for instance. wish to use it. However, I feel that the “Unknown” card smacks of a fate-oriented worldview rather than a choice-driven one, since it represents “an answer that’s not yet meant to be revealed.” Perhaps it is a nice addition for those who use Tarot for fortune-telling, but for those who want to use it for brainstorming, assessing options, etc., this card should be removed. It would be understandable for people to accuse the Crystal Visions Tarot of being a Barbie doll deck. There are no figures in the cards more than a size 8 (in British sizes, that would be size 4 in America) apart from the Empress who is heavily pregnant. There are only Caucasian characters in the cards, and every figure is young and incredibly beautiful, with the male figures often boasting rather chiselled muscles and all of the women in the suit of Cups looking like they just stepped out of a Victoria’s Secret catalogue. But this is a fantasy deck: of course everybody’s going to be godlike or a nymphette! 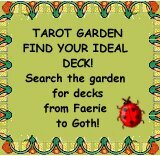 If you want realism in characters, you can go pick up the ever-widening range of decks suited to this, such as the Cosmic Tribe Tarot, Ancestral Path or World Spirit Tarot. As a Tarot deck in the fantasy genre, the Crystal Visions Tarot is a beautiful, evocative, and superb example of its theme. The colours on their own are really breath-taking, though perhaps they also make the deck more suited to female readers (even the card backs are pinks and purples, with flowery and almost Victorian borders – reversible too, for those who are concerned about this.) It would be great for beginners and those looking for an alternative to the Rider Waite, and probably good for readers of the younger generation such as teenagers. I think this is the deck I would have wanted when I was 15 or 16 years old, and I can still see its charm today.